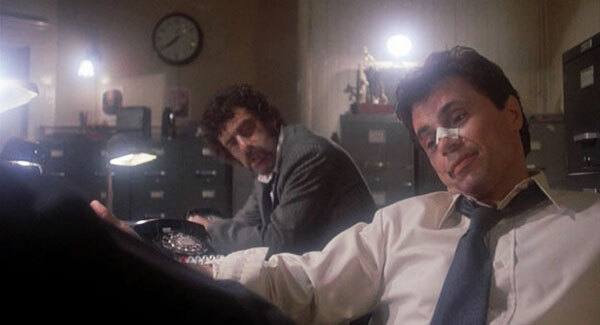 Elliott Gould (Contagion) and Robert Blake (In Cold Blood) are a pair of L.A. tough guy vice cops in the 1974 crime thriller Busting. Keneely (Gould) and Farrel (Blake) find themselves in a bitter conflict with their corrupt superiors as they wage a two-men war against crime czar Carl Rizzo (Allen Garfield, The Conversation). And even when they’re demoted to staking out a public bathroom after they get involved in a nasty shootout, the pair remain ready to break every rule in the book to bring their quarry to justice. The debut of writer and director Peter Hyams (Running Scared), Busting also features appearances by Antonio Fargas (Across 110th Street), Michael Lerner (Atlas Shrugged, Part One), Sid Haig (Galaxy of Terror), Cornelia Sharpe (Serpico) and William Sylvester (2001: A Space Odyssey). The film is acknowledged as the main inspiration for the TV show Starsky & Hutch, which was launched in 1975.